Beaulieu will start up the National Motor Museum’s legendary Lotus 49 at the International Autojumble to mark 50 years of the popular event which began life in the same year that the car was built. 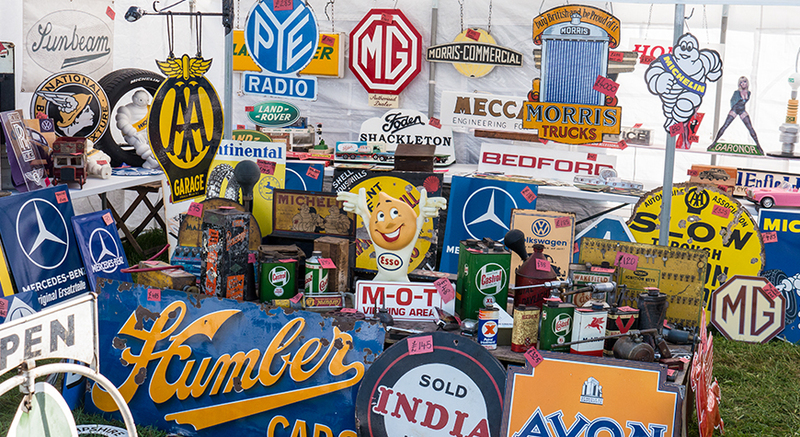 The International Autojumble celebrated its 50th event in 2016 and this year reaches its 50-year calendar anniversary. From humble beginnings, the show has grown to become unmissable date on classic car enthusiasts’ calendars with more than 2,000 stands offering motoring spares, accessories and automobilia. As the saying goes, if you can’t find it at Beaulieu, you won’t find it anywhere. One of the stars of the Bonhams sale of collectors’ cars and automobilia at the show on Saturday September 2nd will be a 1921 Napier, built in homage to Malcolm Campbell’s Blue Bird and powered by a colossal 12-cylinder 24-litre Napier Lion aero engine. Other lots include a 1907 Humber 15hp, a 1971 Ferrari Dino and a 1935 Austin taxi. Admission to the sale room is by pre-booked catalogue only, so make sure to register in advance with Bonhams. See www.bonhams.com/auctions/24121/ for more details. Automart is sure to have enthusiasts reaching for their wallets, with up to 200 classic cars for sale on the Events Arena, while the automotive temptations continue in Dealermart with a range of first-class classics for sale by dealers. Sunday will welcome Trunk Traders to the event fields, as jumblers sell off their unwanted motoring items from the boots of their cars. There are sure to be plenty of bargains laid across the traders’ trestle tables. Show media sponsor Practical Classics magazine will be showcasing its long-term Ford Model T project as it nears completion, with the magazine’s team meeting and greeting enthusiasts on its stand. Equally popular with visitors, show sponsor Ringwood Brewery will offer visitors a taste of its cask beer straight from the award-winning New Forest brewery. Admission to the National Motor Museum and Brabazon Restaurant for breakfast on both event days is from 8.30am, while the main event opens from 10am to 5pm on the Saturday and 9.30am to 4.30pm on the Sunday. A free shuttle bus will run between the car parks and Beaulieu’s Visitor Reception during the show, while a free delivery service will help autojumblers take their heavy or bulky purchases back to their cars. International Autojumble event tickets include access to all of the Beaulieu attraction, including the National Motor Museum and its collection of more than 250 vehicles, the new-look World of Top Gear, On Screen Cars, the 13th century Beaulieu Abbey, Palace House – which has been home to the Montagu family since 1538 – and its stunning grounds and gardens. To book tickets in advance online, for prices or more information see www.beaulieu.co.uk/events or call the ticket hotline on 01590 612888. Exhibitors and Trunk Traders can email the Events team at events@beaulieu.co.uk or call 01590 614614.